Had another fantastic day out collecting samples from the helicopter today. I was awoken up by the usual breakfast announcement and weather forecast over the ships intercom: Minus 15 and fog. I snuggled back under the duvet for at least an extra 10 minutes while contemplating the exact whereabouts of my thermals and thermos. Needlessly as it turned out, because it was too foggy to fly anyway. By midday the fog had burnt off though, leaving some stunning flying (and working) conditions. Which was lucky as my thermos turned out to have been incubating some coffee for about a week! Anyways, we jumped into the helicopter at about 13:00 after having eaten our packed lunches on the ship, and headed towards the Greenland coast to try and bag some of the most westerly samples that we will collect. 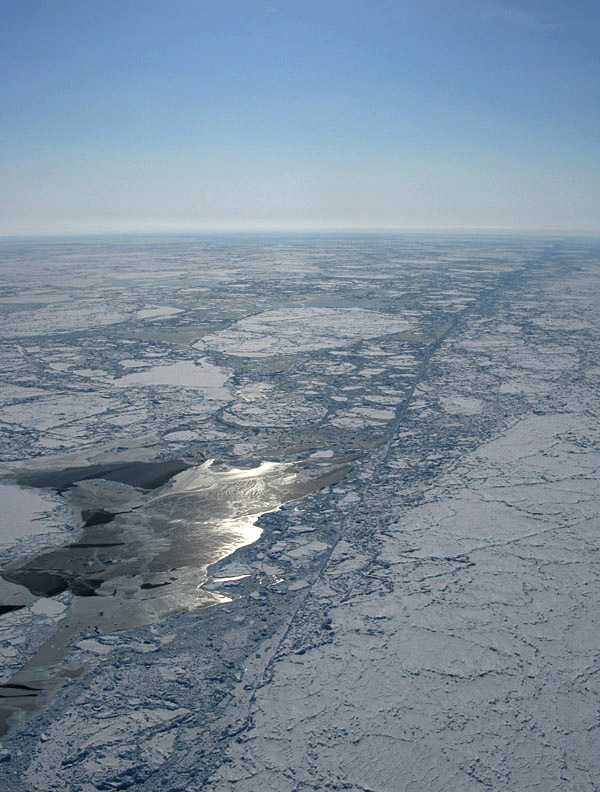 As we approached the coast, a distinct line was visible in the ice running north-south as far as it was possible to see in either direction (see picture below). This is the boundary between sea ice drifting slowly southwards over the East Greenland Shelf (left hand side ) and ‘fast-ice’ which is sea ice that is permanently frozen to the coast, and pinned in have run aground (right hand side). The ridge is the result of the moving ice being pushed up against the stationary ice. Theoretically one could walk to Greenland from the western side of the ridge, as the ice doesn’t drift and there are very few leads (areas of open water). In fact, there were so few leads that we couldn’t find anywhere to deploy our instruments and had to turn around after searching for a while. 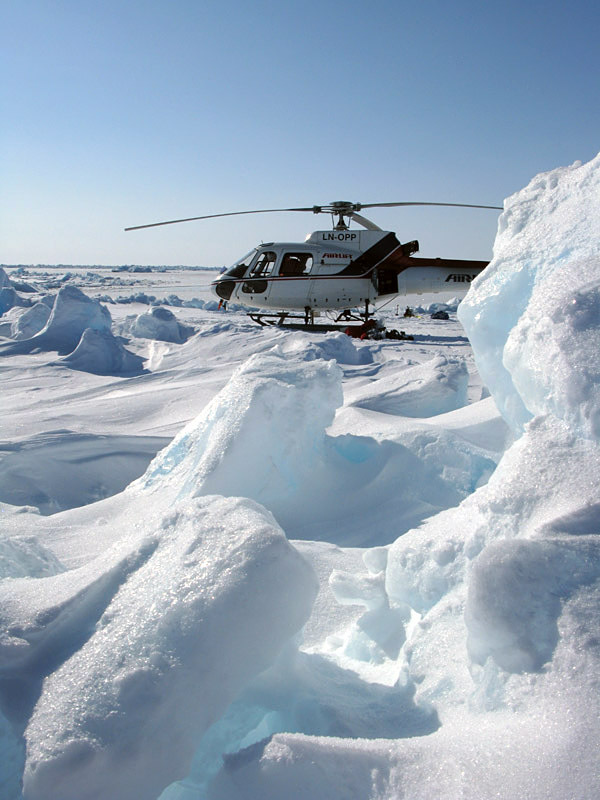 We did manage to land in the two other places we had planned to though, and both sites turned out to be quite spectacular, with big pressure ridges and blocks of ice, which had been pushed up as floes had collided. 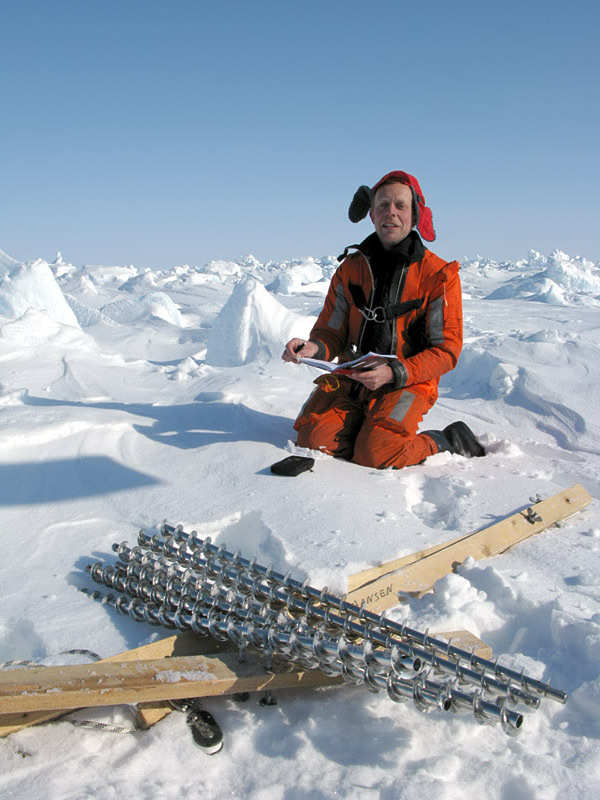 The flying team is now generally made up of two oceanographers and one sea-ice specialist. Today Gorm came with Edmond and I so that he could make some ice thickness measurements. This basically involves drilling a hole in the ice with a very big and very long drill bit, then measuring the depth of the hole. You can see him and the drill bits in the the picture below. The ice is quite easy to drill through, so he can just use an pretty ordinary cordless drill at the end of that thing even when all the sections are stuck together. The crew of the KV Svalbard were having yet another safety practise (these happen every couple of days, and I keep having to play the guy with horrible burns and smoke inhalation!) 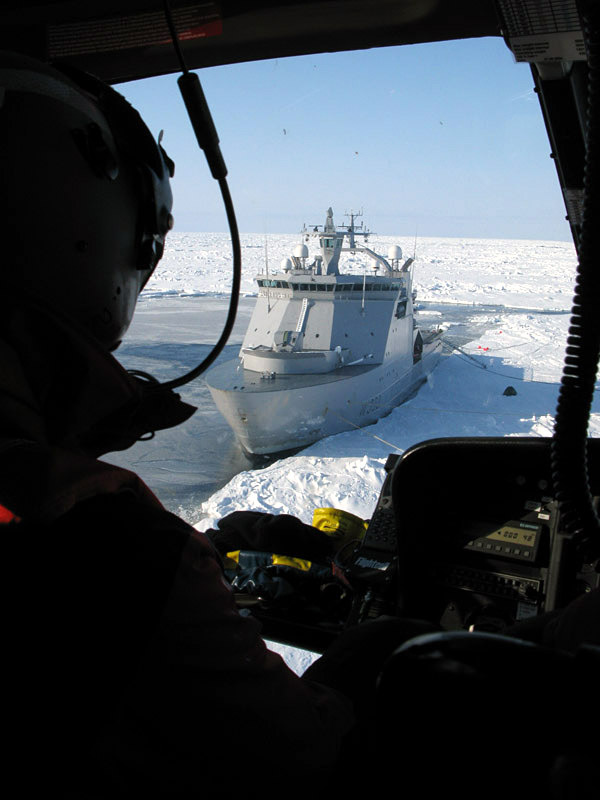 when we wanted to fly back to the ship, so we had to wait on the ice until the helideck staff had finished extinguishing a fake fire before we could take off to return – so we got to spend some time just admiring the scenery and drinking coffee which was really great. 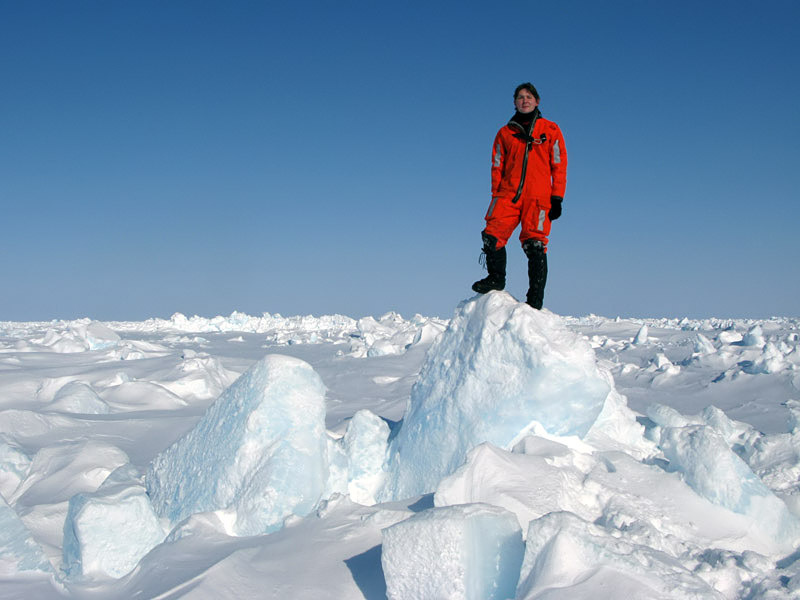 Usually we have be quite focused and work quickly when out on the ice so there’s not much opportunity to absorb the environment. When we returned to the ship we got to fly several loops at quite low altitude while Edmond took a video of the ship out of the window to be used in …. another a safety simulation for the crew! Still it’s pretty cool to look out of the window and see people on the bridge at eye-level. Still, hopefully the weather will be kind to us!